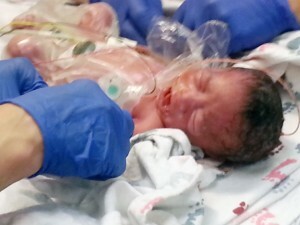 What are the chances of seeing 2 sets of mono mono twins in one week in the same NICU? There’s only a 1 in 10,000 chance that a woman will become pregnant with monoamniotic twins, a condition where twins share the same amniotic sack. So it’s almost a statistical impossibility to have 2 sets of monoamniotic twins residing in the NICU at Akron Children’s Hospital. Sarah and her husband, Bill, discovered she was pregnant with monoamniotic twins, a rare condition where the twins share an amniotic sack. When twins share an amniotic sack, there are many risks to monitor. The twins’ umbilical cords can become entangled or compressed. And there’s a risk that one fetus’ cord might wrap around the other one’s neck.